Our business field is expanding. We are working for the benefit of progressive, future-minded industries. Molding dies are sometimes called "mother tools". This is because they are the base for all kinds of industrial products. Yamaichi Seiko owns ultra-precise technology and molding technology for dies, and contributes to the manufacture of products in a wide range of fields. Above all, as specialists in the manufacture of instruments that require measurement in microns, we are indispensable for industries that promote miniaturization and lightening technology. Moreover, our ultra-precise technology can respond to any kind of product in any field. Our business fields will continue to expand in the future, because our technology is always in a state of progress. 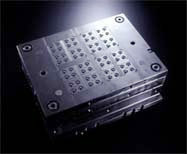 Yamaichi Seiko's dies and molds have been mainly used as connector parts. Recently, we have started manufacturing molds for memory media, communication equipment and medical instruments.